Business profitability does not revert to the mean. The opposite is true, but only for the best, most profitable businesses. Aversion to the mean is asymmetric. Why? Improvements in productivity have accrued almost exclusively to the most productive businesses. Our conclusion – own only the best and forget the rest. The notion of reversion to the mean is a central tenant of finance theory. Accordingly, the abnormally profitable firms should see returns decay over time towards average, while the weakest firms should drift upwards. In theory, average acts like a magnetic force, pulling firms far away from the mid-point towards the centre. The reality has been different. Rather than mean reversion what we have seen is mean aversion, but only at the top end. The most profitable firms have further distanced themselves from the crowd. Interestingly, for the most profitable 25% of companies ROIC approximately doubled over the last 15 years, but for the top 10% returns increased by about 4x. ROIC for the most profitable decile increased from 3x the median in the 1990s to 8x. However, there has been no improvement in returns for the weakest cohort. Mean aversion has proved asymmetric. Importantly, it is not simply the case that the top 10% of firms today are far more profitable than the top 10% of stocks 15 years ago. This is the concept of persistence. According to McKinsey, 85% of the firms that made a return of 25% or more in 2003 were still doing so ten years later. 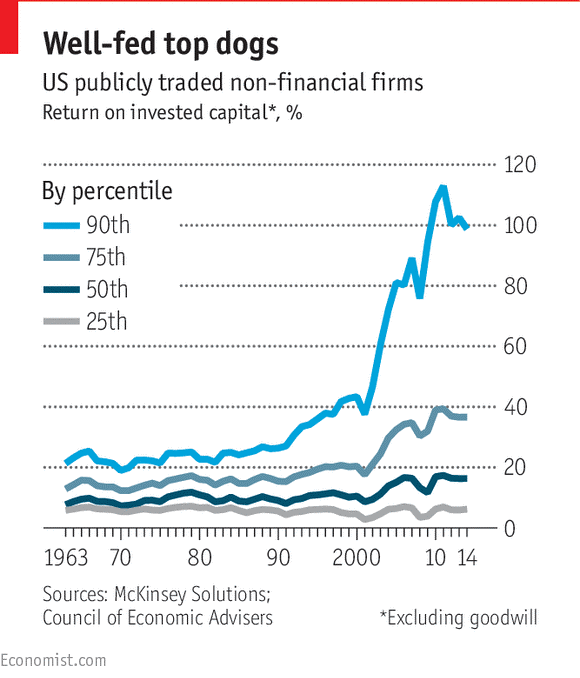 High returns are persistent and have become increasingly so - in the prior decade the persistence rate was only 50%. So, the individual firms that comprised the top decile 15 years ago have themselves become far more profitable. Why are the best firms getting even better? One argument would be that most industries have become more concentrated over the last couple of decades. However, this would argue for all firms becoming more profitable through diminished competition, including the weakest ones. It doesn’t explain why the improvement has been so skewed towards the best firms. Productivity may provide the answer. According to the OECD, the most productive 5% of manufacturers increased their productivity by 33% between 2001 and 2013, while the productivity of all other manufacturers increased by only 7%. For the top 5% of service companies productivity increased 44% compared to an increase of just 5% for the other 95%. Contributing to the rising dispersion in productivity between the best and the rest is the widening of pay outcomes. The gap between what the average and the best firms pay their workers at all levels has widened. Naturally, this improves the ability of the best firms to attract the best people relative to average firms. At Aoris we want to own the very best businesses, those in the upper decile of ROIC but only where we are confident in the persistence of those returns. We are not interested in owning businesses with below-average profitability in an expectation that they will benefit from mean reversion, a gravitational pull to the centre. We want only those businesses with such powerful and durable competitive strengths, preferably where there is a “self-reinforcing” element to these strengths, that they will push further and further away from the centre.